UBA Online banking has taken another level with banking on your favorite chat apps; messenger and whatsapp . This messenger banking and whatsapp banking is known as UBA Chat Banking. United Bank for Africa (UBA) is a pan African bank with head quarter in Nigeria that offers modern banking solutions such as online banking,specialized banking,mobile banking among others. The Bank operates in Cameroon,Gabon,Kenya,Nigeria and other African countries. The bank as of now operates in at least 20 Africa countries with other offices in UK,France and USA. The UBA group offers personal banking services (saving account,money transfer,current accounts and others),cooperate banking ,Diapora account service(Video Banking), mobile banking .internet banking and more. UBA equally operated a foundation called the Tony Elumelu Foundation as earlier mentioned. United Bank for Africa (UBA) is one of the banks i admire because of their commitment to making banking digital and making your account accessible by every method. The Bank promote innovation in Africa through the Tony Elumelu Foundation. As indicated in the title of this post we are going to discover more about the UBA Leo chat banking services on messenger and whatsapp. 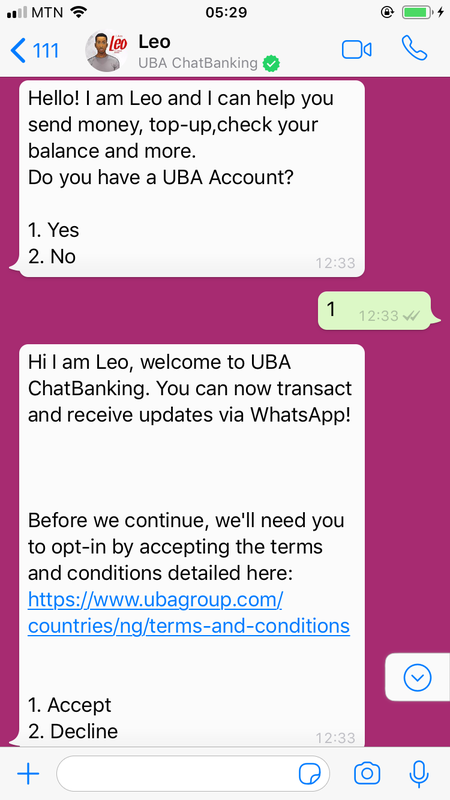 What is UBA Leo Chat Banking? The UBA chat banking is an application (bot) that assist UBA account holders to carry out banking transaction on social media messaging apps. For the moment the App works Facebook messenger and whatsapp . This chat based banking service is very necessary in today's generation as many people spend time on their home and on messenger. It makes banking easy . This bot is referred to as Leo . This is why you will find people call it Leo App,Leo chat banking,Leo messenger or Leo whatsapp. To use the app is very easy as you need thi social media apps on your phone or PCan an active UBA account. According to UBA, the app can work on twitter,skype,weChat and Telegram. But we succeeded to test it on whatsapp and messenger. Search the excat words ''UBA ChatBanking'' on the facebook app and Click on Send Message. 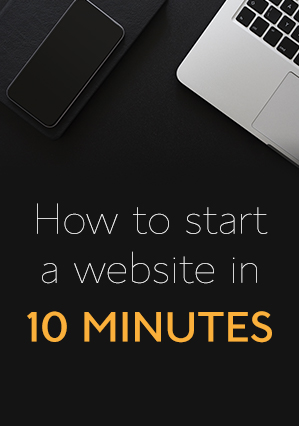 we will cover the step by step procedure in one of our post in the days ahead. If it is your first time of using the app, you will need to register. You can use your phone,UBA secur pass or pin to validate transactions done with LEO on Messenger. To access Leo on whats app, you need to save a particular number depending on your country. For the moment i was able ti find UBA WhatsApp chat Banking number for Nigeria. The UBA Leo whats app nuber for Nigeria is +234 903 000 2455. To find out more about the availability of the whatsapp option for your country contact you bank or the customer service of UBA o Facebook and twitter. Make sure you select your country as the default page is for Nigerians. 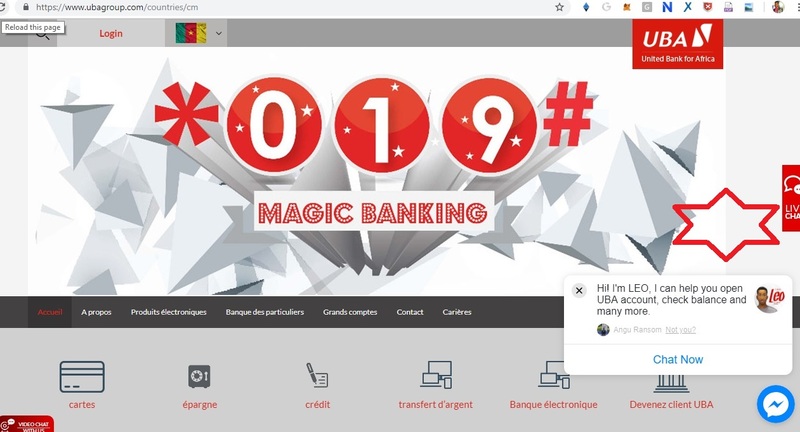 What Can you do with the Chat Banking Service? As mention earlier, the UBA Chat Banking service enable you to perform your financial transactions online. 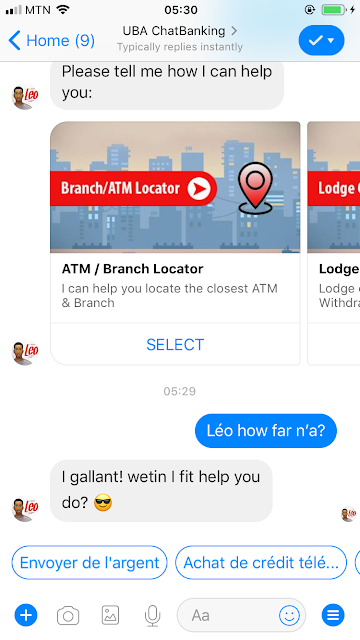 You can use the chat banking service to transfer money,check your account balance,open a UBA account,download account statement,locate ATMs,pay bills,buy airtime ,receive transaction alerts,and more. Who Can use Chat Banking? Anyone can use the App provided you have an active account at UBA. What can you say about LEO by UBA ?